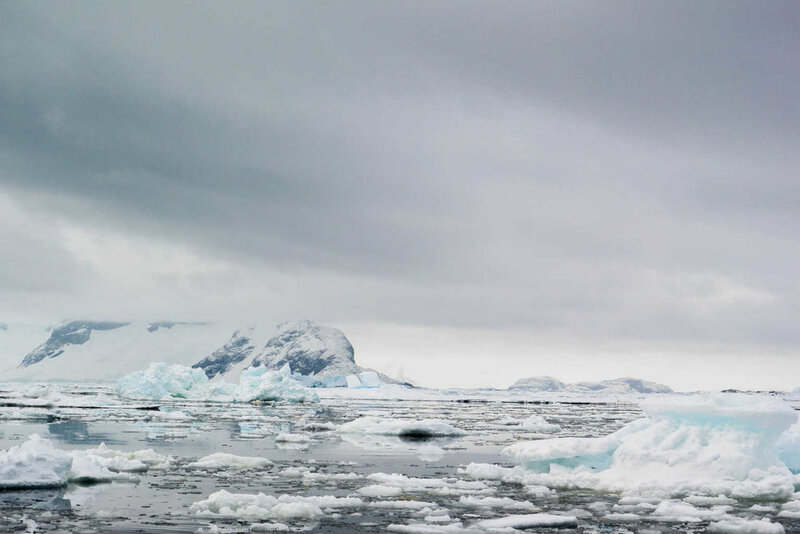 Have you ever wondered what it's like to actually be in Antarctica? I'm not talking about this snowstorm we're all barely surviving... I'm talking about an actual Antarctic adventure, an Antarctica vacation. Yep, playing with the penguins, sleeping under the stars (in the snow), and polar plunging into the deepest depths of freezing water. Watch out! Iceberg ahead! 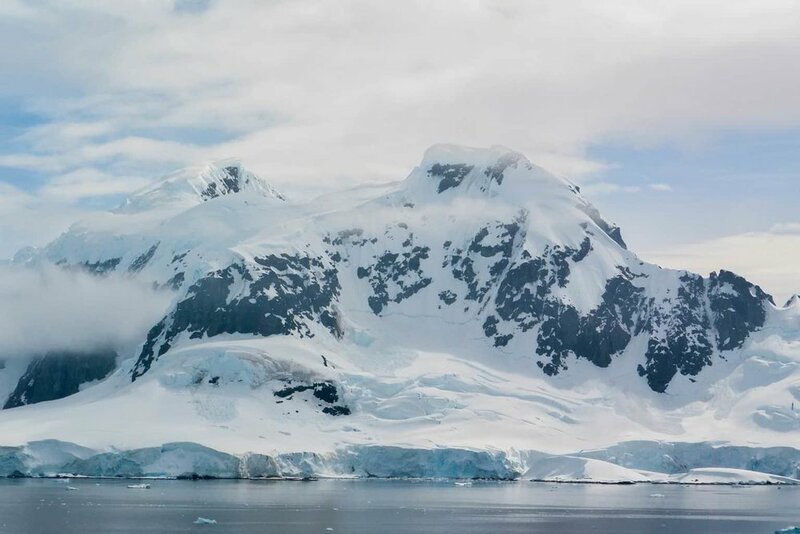 Amy's sharing her latest adventure in this special guest post on her recent trip to Antarctica. Here we go again, its Amy’s annual guest post about her travels across the world. I used to always get asked the question what has been your favorite trip, and I never could answer it with one place. I would always justify loving every place I have been, but I can honestly say that this trip has been the most memorable favorite trip I have taken in my life. Three weeks ago I went to Antarctica! Planning this trip takes me back over a year and half ago to when I got back from Thailand. At that point I had visited 6 of the 7 continents, and knew I was going to go to Antarctica. Most of my trips have been with my brother, however for this grand of an adventure, my dad decided to join us. We finally booked our trip in November 2014, and at that point a trip in December 2015 seemed way too far in advance to get excited. As we all know, time seems to fly by as we get older, and before I knew it I was packing to visit my last continent! Before we could get to Antarctica, we had to fly over 24 hours to the tip of Argentina. We traveled to a town called Ushuaia. We had one day in Ushuaia to play (and really give us time incase there was any weather or flight delays… the planner in me). The first day that we were there we hiked up to Martela Glacier, one of the only glaciers that you can easily walk. That night we had dinner at Maria Lola’s. If you ever find yourself in Ushuaia, Argentina, you HAVE to go! It was an amazing view, and the seafood was incredible. That night, we embarked on the Ocean Diamond for the greatest adventure of my life! Over the next 2 days we cruised from Argentina to Antarctica via the Drake Passage. If you know anything about oceans and seas (which to be honest I still don’t know much), the Drake Passage is considered the roughest seas in the world. Luckily on our trip down we had pretty fair conditions. Finally on December 31 we were able to get off the boat for the first time! We went on zodiacs to Deception Island, Antarctica. That was my first experience walking on the islands of Antarctica, and was I excited that I did it the last day of 2015! Before we got to the island, we boated around for about an hour and half following a whale. Unfortunately, I was also sitting in the front of the zodiac, and was getting buckets of water dumped on me. Needless to say, I was not the happiest of people sitting there soaked! The island is an active volcano that last erupted in the 60s, and still has that wonderful smell of sulfur. When walking around the island, we saw penguins for the first time up close! I just love how much they are willing to go up to humans and investigate us since we are invading their space. That night was New Year’s Eve, and I must say that I was not expecting a lot. I was on a boat, with my brother and dad, but I was thoroughly surprised how much fun I had that night! I found out that the passengers, about 185 in total, were the youngest that the boat had seen in a while. On the boat, I made friends with some of the most amazing people. To hear everyone’s stories of why he or she was on the trip was great! I would say the little bubble of that boat will always stay with me, from the nicknames that were created to all the little jokes. Back to the exploring! The first day of the new year, we went to Foyn Harbour, and while we were on the zodiac we saw humpback whales, penguins and a shipwreck! The sights that I see in my brain cannot even begin to be described by words or pictures. Every time we went out of the ship, I was just filled with awe and wonder of the land around me, and how untouched Antarctica is! That afternoon we had a landing at Port Lockroy and Jougia Point. 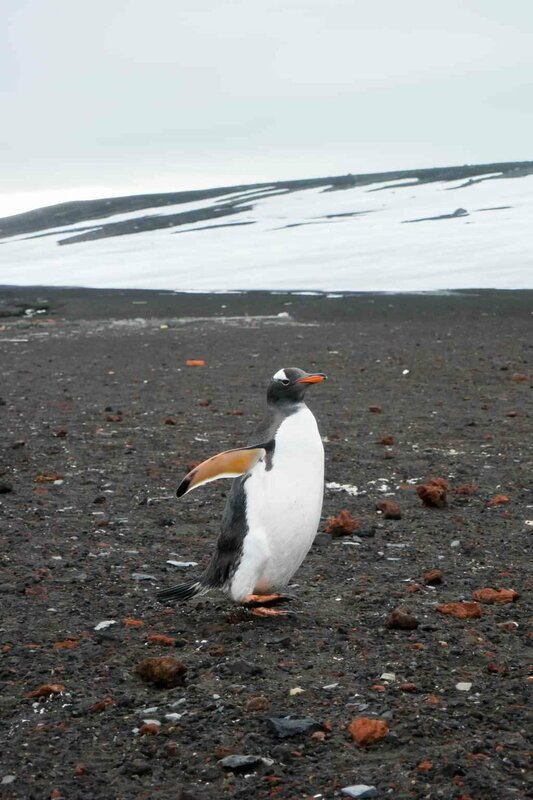 While we were there, we saw hundreds of penguins, including babies and eggs. I have come to learn that penguins are not the smartest animals, and will steal rocks off each other’s nests. The way they wobble around and hop just makes me laugh! We were supposed to go camping that night but the conditions were not fair enough, so we had to save that for another night. On January 2nd, we went to Danco Island were I got to snowshoe up a hill. It was amazing to see Antarctica from a different point of view! To look out over land and water really took my breath away, and I was in the awe of how small I am compared to everything else. I asked one of the guides, "Does Antarctica ever lose its awe and wonder coming to it time and time again?" The guide said, "I don’t think that it will ever lose its wonder." I love that; no matter how many times you go to the same place it still can captivate you. That afternoon we went to Paradise Harbour, which was our first time on Antarctic Peninsula not just the islands. We hiked up a hill and just sat on rocks for at least half an hour. I loved all the still moments that I was able to have while in Antarctica. That night we went camping! I was very excited to be able to say that I had camped in Antarctica. The weather was looking amazing when we left and while setting up camp. Keep in mind that the sun was not going to set at all, so it was just hazy all night long. I did not sleep in a tent, I slept in a sleeping bag in a bivy sack. We had set up camp and were taking a group picture when it started to rain. At that point everyone decided it was going to be easier to just get in bed then stay up. I was not tired at this point, so I crawled into my sleeping bag and just laid there. Over the course of the night, it rained and was super windy the whole time. I probably got 2 hours of sleep, but looking back it didn’t matter at all. The next day, the conditions were not fair enough to leave the boat so we did not do any landings or zodiac rides. One of the great things about the ship is that they always have lectures for you to go to if you are interested in learning about the history, marine life or really anything about Antarctica. Things cleared up, and that afternoon we were able to do a landing on Mikkelsen Harbour. While we were out there, I just had this weird feeling that this could be the last time that I was able to go out and walk on Antarctica. So before I went back to the boat, I just sat and embraced everything that was around me, including the lovely guano smell. For those of you who don't know, guano is penguin poop. I knew the day was coming; January 4th would be the last day that we had the chance to leave the boat to explore Antarctica. That morning we went out on the zodiac to ride around Petermann Island. That morning was my favorite zodiac ride of the whole trip. There was so much ice in the water, and the way that zodiac just glided around was incredible. One of the things that I learned was that when ice/snow reflects off the sun it appears white but when it reflects off itself, it is this magical blue. I have never seen that natural blue before! To look in the crevices of icebergs and see the blue, was one of my favorite things. That afternoon we went out on a zodiac ride around Pleneau Island. We saw so many seals that afternoon! They were all laying out to take in oxygen so that they could dive deeper when they went back in the water. When we got back to the cruise boat it was time for the Polar Plunge. 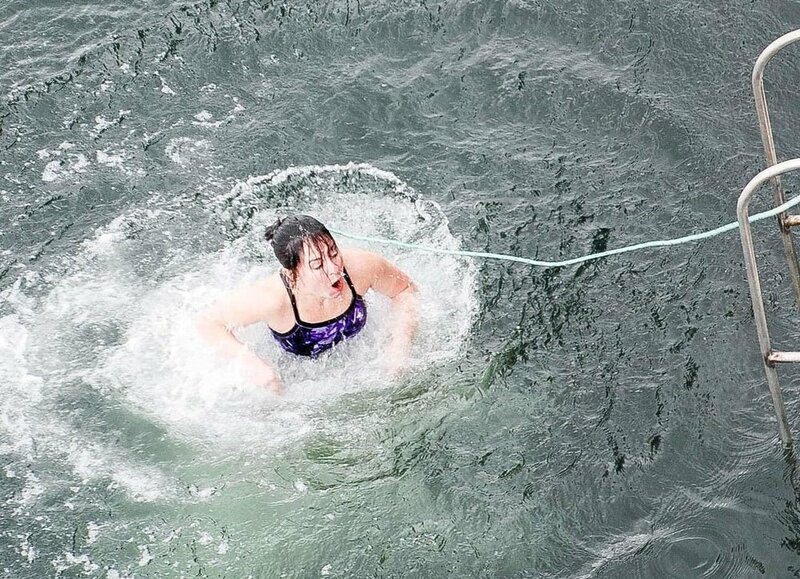 I was in full aware that I was about to jump into water that was below freezing but I could not be more ready! As jumped off the dock (with a rope on) all I could think was here we go. Coming up from the water I was basically in shock, the guides kept telling me to keep breathing because clearly I was freaking out. I swam over to the ladder to get out, I could not put my foot on the bottom rung and had a minor freak out. Finally, it was time for our long journey back to Argentina. The first day was not too bad in terms of rockiness, but the second full day on the boat was rough. As I like to say, I was horizontal for a good 7 hours that day. They said that on a scale of 12 the waves were at an 8! At one point they said that they saw 50 ft swells! It was a great time to get some rest and be alone. Then it was back to shore and a fun-filled 24 hours worth of flights back to the states. These words cannot begin to really say how I felt on this trip. If you ever want to go to Antarctica (or Arctic area or Galapagos) you should go through Quark Expeditions. They completely exceeded all my expectations, and were so knowledgeable. The expedition team was so fun and full of life. Also, as a side-note, I might have listened to Adele’s new album the whole time while writing this because it is what I listened to the most while on the boat. If you haven't, you should look it up and listen to it on repeat. Amy's adventure inspired me, what about you? Are you ready to go play with some penguins or what? I loved all the pictures Amy came back with from Antarctica. Amy asked me when she came back if I would take a bible verse or quote and put it on one if the images. Of course I love any excuse to dive into some fun typography, so I agreed! I did one for your cell and one for the desktop. Download them for yourself. I'm using mine as a reminder to go on an adventure this year.